There have been many ideas pitched for how Toronto should deal with the slowly crumbling Gardiner Expressway, from tearing it down to turning it into an elevated park. None, however, have been quite so bold as a new plan from CORE Architects. Pitched as part of the Toronto of the Future exhibit at Metro Hall, the plan is called "Dig Down and Build Up" and imagines a radically transformed Toronto. 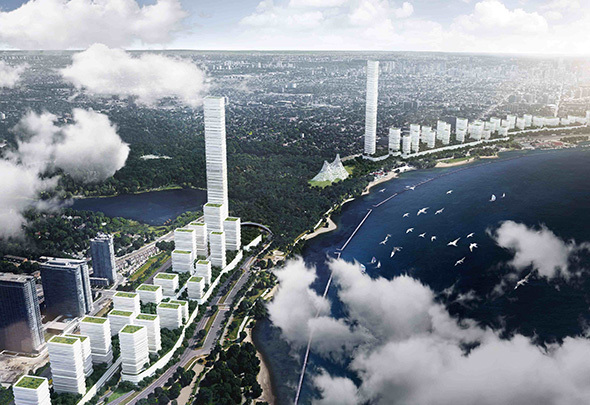 In a nutshell, the concept calls for both the Gardiner and Lake Shore Blvd. to be removed in favour of a 12-lane tunnel that would span 10 kilometres across the foot of the city. A two-lane road would remain above ground to service residents and businesses, and a network of green space would be installed to enrich the city's lakeshore. "By conservative estimates, the land value of this 14km stretch is $8 billion in today's dollar. The sale and development fees of this land should offset a sizeable piece of this project's cost. Public funds will cover only part of the cost since a good chunk of it can come from sale of the lands." That sure sounds simple, but the scale of the idea is so ambitious that it makes Buckminster Fuller's ideas look conservative. One suspects that Toronto isn't ready for urban design on such a grand scale (can we have that Downtown Relief Line now, please? ), even if the possibilities suggested by such a project are staggering.